Dusterman is a transcript of Joe’s diary and memoirs, including photographs, while he served in Vietnam in a specialized Army mobile combat team and body recovery unit called “Dusters” attached to the Third Marine Division along the DMZ in 1967 and 1968 during TET. 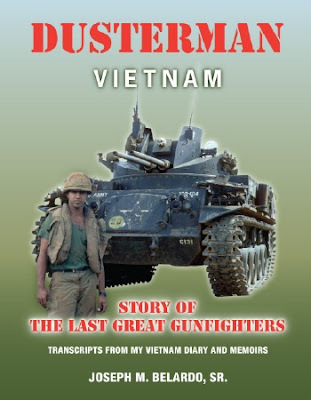 His book will take you across the DMZ and gives a detailed, day-by-day, frontline battle and body recovery narrative of daily combat life while attached to the Marine Corps. His fascinating, introspective memoir reveals a sensitive soul’s struggle to be physically and mentally strong amidst unimaginably horrible suffering and dying. Joe and his crew hold the distinct honor of being the last to leave the finally abandoned Khe Sanh Combat Base. Joe’s medals include the Bronze Star with Valor, Purple Hearts and numerous Marine Corps and Army medals and citations. Copyright Joseph M. Belardo, Sr.. Simple theme. Powered by Blogger.